Recently Thor Dulay's latest album "Master Of Soul" produced by Cornerstone Music, and distributed by Star Music, has launch at Music Hall, Metrowalk Ortigas. The event was attended by Thor's dear friends specially Apl.De.Ap, supporters and media who always beside him through the years. 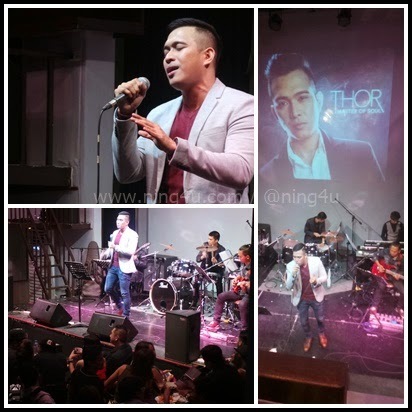 Thor's journey is not an easy path nor a newbie in the music industry. His releases his debut album in 2004 "Believe In Me" and 'Wonderland" under Warner Music, 2007 "Duets With Thor" under Ivory Records and number of shows, front-acts for various concert of local and international singers. But all eyes are on Thor when he join "The Voice Philippines Season 1" specially when he become the very first four-chair turner. R & B genius slayed his own version of Whitney Houston's "I Have Nothing" and made it to Team APL and eventually to the Top 8. Today Thor officially releases his newest album " Master Of Soul", composed of 12 tracks that includes six (6) revivals and five (5) original and a bonus track. The revival songs are "I Miss You" (dedicated to Ms. Kris Aquino), "I Have Nothing", "There's No Easy Way, To Break Somebody's Heart", "I Finally Found Someone" (featuring Radha), "Kung Maibabalik Ko Lang" and "Bakit Kung Sino Pa". Included in the original composition in the album are "Paano Sa Sasabihin" (official music video is already out also), " 'Di Nagpaalam", "Kung Talagang Wala Na Tayo", " 'Di Na Maibabalik", and "Ikaw Na Lamang Siya". Thor gave a remarkable performance, by singing some of the tracks on the album. On the hand, Thor and his friends in the industry sang some cover songs like "If I Ain't Got You" with Liezel Garcia, "End Of The Road" with Daryl Ong and more.